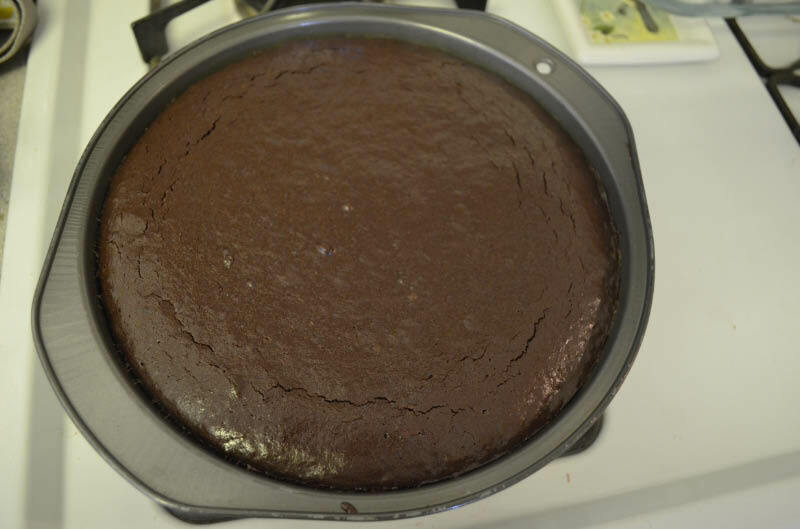 This almost flour-less cake (1 1/2 tablespoons of flour) could easily be called “death by chocolate”. Looking at the recipe ingredients and reading the early comments by other bakers, I knew this was going to be rich. It was absolutely delicious! I took the cake to share with my knitting group and we were only able to eat half of it. So I have about half of it sliced and wrapped in the freezer to enjoy later. The white chocolate cream was a great addition, but just plain whipped cream would have been just fine. I substituted coffee for the bourbon in the cake. I think the coffee enhanced the chocolate flavor. I didn’t add bourbon to the white chocolate cream either. Instead I used a bit of vanilla and some almond flavoring. It was an excellent substitution. I plan to make a raspberry sauce to serve over the pieces that I have in the freezer. I can’t wait to get home from my business trip and try that! 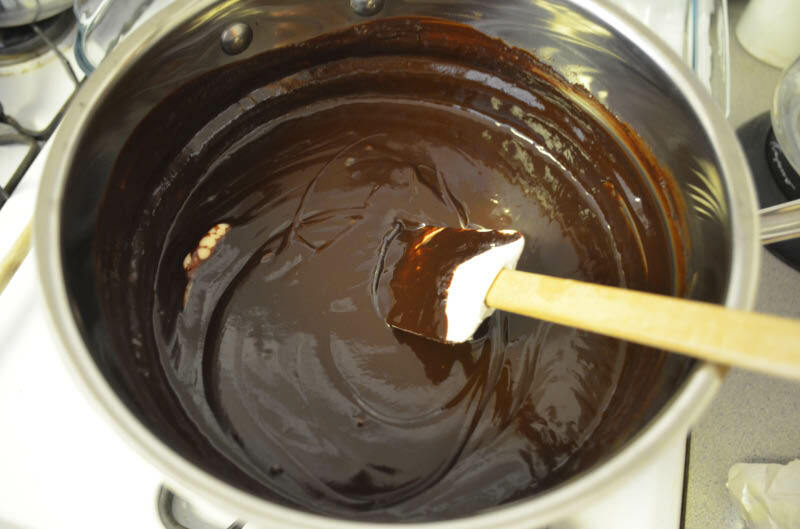 I melted the chocolate and incorporated the butter in my double boiler. 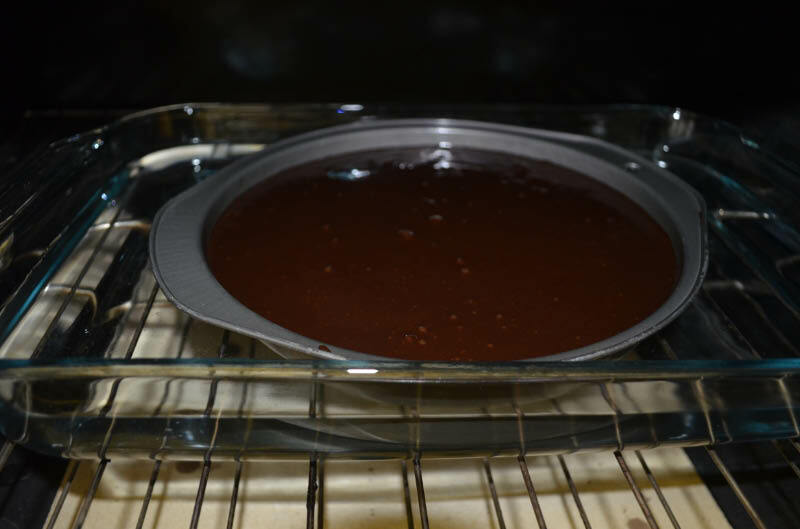 The cake is baked sitting in a large pan of water. I baked my cake for 40 minutes instead 30 as the recipe required. The top had some small cracks in it when I removed it from the oven. The host for this Tuesdays with Dorie assignment was Cathy of A Frederick Food Garden. She posted the entire recipe on her blog. Thanks Cathy for a great post! 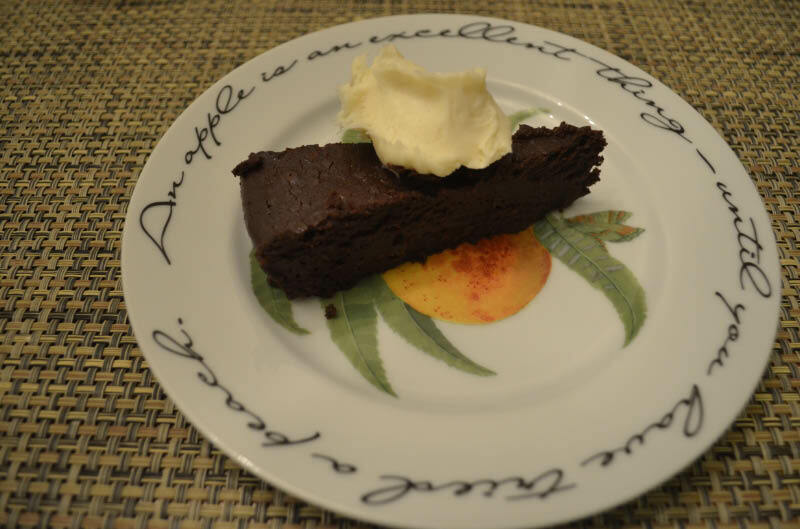 To see how the other Baking with Julia participants fared, visit the LYL section of the Tuesdays with Dorie blog. Your cake and cream looks great! I used a double boiler for the batter too. I had a group of 12 friends, and we did finish the cake! Was the coffee flavor very strong? This cake sounds amazing! No the coffee flavor really compliments the chocolate. It is a great cake and very easy to make. Raspberry goes great with this! I only wished I had placed the extra in the freezer instead of sending it into work with my husband. Loved this!